In May of 2009, Kori Schulman joined the new media team at the White House, now known as the Office of Digital Strategy. Prior to this role, Kori was a graphic designer for President Obama’s 2008 Presidential Campaign based in Chicago and the 2009 Presidential Inaugural Committee in Washington, DC. Before coming to the White House, she worked on the book Designing Obama, a chronicle of art from the 2008 campaign. Born and raised in Chicago, Kori concentrated in American Studies at Brown University and studied graphic design at Central Saint Martins. Follow Kori Schulman on Twitter @KS44. 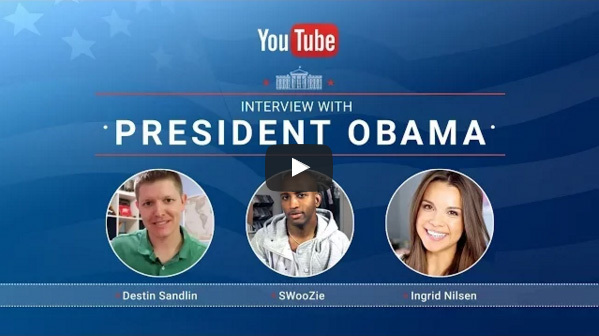 YouTube stars Ingrid Nilsen, Destin Sandlin, and sWooZie sat down with President Obama to ask questions following the State of the Union. Got a question for President Obama? Join in the post-State of the Union YouTube interview. President Obama finally launches his own Facebook page with a video about our efforts to combat climate change. Follow along as President Obama hosts the 2015 White House Tribal Nations Conference and roundtable with Native youth.